I should be smarter. I should be able to classify and categorize based on Google findings if nothing else. But this one eludes me. 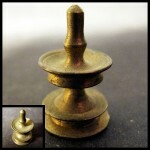 Dad sent it along, troche symptoms and it seems to be machine-turned brass from India – maybe even with spiritual or religious symbolic significance. But I’ll be damned if I can figure out what it is.